Local vendors, conversations and demos of options like these will fill the lovely grounds of the Kemper Center for Home Gardening on Saturday June 2, when the Green Living Festival returns to the Missouri Botanical Garden. Whatever your Green interests, you’ll find something useful and inspiring at this hands-on, day-long indoor/outdoor event. Hosted by the Garden’s EarthWays Center, the festival invites visitors of all ages and backgrounds to explore the links between sustainability, energy efficiency, conservation at home, and a healthy environment. A roster of fast-paced Presentations to the People from 10 a.m. to 3:00 p.m. will feature local experts in solar power, sustainable cooking with natural gas, native plant NatureScaping, bee keeping, composting, and how to volunteer and invest in sustainable ways. More in-depth DIY demonstrations will offer eco-friendly tips and tricks for Greener living, every day. This Fest is family friendly! Kids will have fun building a solar-powered racing car, sampling treats cooked in solar ovens, or decorating a recycled ceramic tile. Complete the Sustainability Scavenger Hunt and get a colorful EarthWays patch! Snap that Green Selfie with a costumed recycling character, or in our Green Living Fest Snapchat filter. Enjoy a free, all-levels yoga class for adults and kids hosted by STL non-profit Yoga Buzz. Bring your own yoga mat or towel. Recycling and composting will reduce the festival’s “waste-line.” Bring your reusable bottle and get free water refills. Use Bike St. Louis routes to cycle to the Garden. Cycling lanes on Shaw and Tower Grove Avenues connect to routes through Tower Grove Park, along Grand, and on Macklind Avenue. The Garden’s bicycle parking is always convenient and free! Volunteer help is welcome! Contact Simon Warren, EarthWays Volunteer Coordinator, for details at simon.warren@mobot.org. 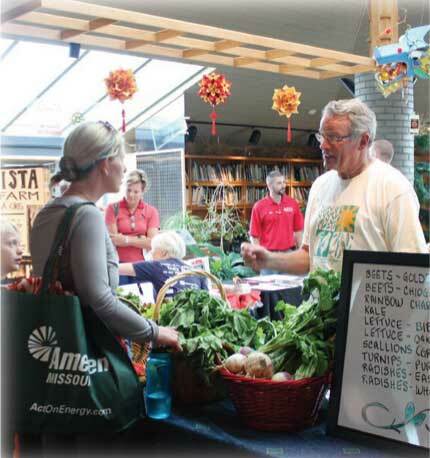 The Green Living Festival is presented by Ameren Missouri with additional sponsorship support from The Boeing Company. This festival is included with Missouri Botanical Garden admission: $12 for adults and free for children ages 12 and under. St. Louis City and County residents enjoy free admission on Saturday before noon and $6 thereafter, with proof of residency. EarthWays Center is the sustainability division of the Missouri Botanical Garden. Our work enriches lives and protects plants and our environment by educating and connecting people to practical sustainable solutions where they live, learn, work, and play. Learn more at www.mobot.org/sustainability or call the EarthWays Center at (314) 577-0220. This entry was posted on Monday, April 30th, 2018 at 7:01 pm and is filed under June 2018, May 2018. You can follow any responses to this entry through the RSS 2.0 feed. Responses are currently closed, but you can trackback from your own site.